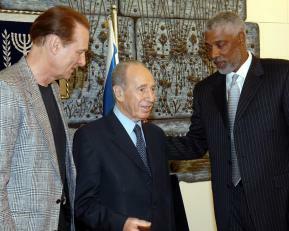 Dr. J made a house call to Israeli President Shimon Peres. Julius Erving, on a goodwill tour, told Peres in a stop at the presidential mansion on Wednesday that he considered himself an “ambassador” for Israel. Erving and fellow NBA Hall of Famer Rick Barry are in Israel to raise awareness for the ‘Tower of Light’ youth village for underprivileged children. “I am truly inspired to be an ambassador for the country and for the village,” Erving said. Dr. J was in Israel to help draw attention to Migdal Ohr (Tower of Light), an organization that helps the poor in Israel. Among the many it helps, Migdal Ohr aids Ethiopian Jewish girls and those from the former Soviet Union who arrive in Israel and helps them absorb into Israeli society. Erving and Barry put on basketball clinics for Israeli youths at Migdal Ohr village. Kudos to them for their good works. Its really wonderful to have Dr. J as a spokesperson for Migdal Ohr and its charitable activities. He really was quite the basketball star in my youth when he played for the Philadephia 76ers. When a pro sports alumni does good works, he should be commended. They don’t make NBA players like they used to. He really was quite the basketball star in my youth when he played for the Philadephia 76ers. When a pro sports alumni does good works, he should be commended. Thanks for making me feel old as I remember — in my youth — when Doctor J played for the Virginia Squires. I even had dinner with him at a private residence back then. The Doctor IS one of the good guys. I’ve been a longtime Nets fan because of Rick Barry and Dr. J. Sports needs more people like these. Rick Barry had that girlie free-throw style, but didn’t he have the record??? It’s really GREAT to see that there are still athletes left that embody the spirit of sports…but how many are there like these two in the present Brat Generation??? ?